Summer is a time for exploring, but if you are an avid camper, you know that your excursions shouldn’t be limited to the summer months alone. Camping in the autumn and spring is equally enjoyable as summertime camping experiences, yet you need to have the right gear to make your treks comfortable and safe. Enter the Sleepingo Double Sleeping Bag. If you plan on backpacking and camping with a partner, a sleeping bag for two is the way to go. It packs down easily into one small, compressed unit, making it more portable and lightweight than two separate bags on their own. If you like to backpack deep into the woods before pitching your tent, you don’t want to sacrifice your comfort for a lightweight option, and vice versa. If you’re seeking a comfortable double wide sleeping bag along with one that is lightweight and easy to carry, look no further. One of the best sleeping bags, the Double Sleeping Bag by Sleepingo, combines a lightweight, easy-to-carry design with a stylish, functional interior. This double wide sleeping bag is the perfect size for adults, teenagers, or even children, with dimensions of 87 by 59 inches. This sleeping bag weighs less than three pounds, making it ideal or even just space-conscious car campers. It comes with two sleeping pillows, meaning you don’t need to tote extra items into the woods on long trips with you anymore. The sleeping bag is durable on the outside yet soft and cushiony on the inside. Made of high quality nylon, this bag is resistant to water and keeps you nice and warm on the coldest of nights. Designed for all year round use, this sleeping bag for two can be used at temperatures as low as 32 degrees Fahrenheit (for sub zero temps, remember to take an extra layer inner cover). With a water-resistant polyester exterior, it holds up well to more challenging weather conditions. There are two zippers in the middle and the bottom of the sleeping space, so that you can separate from your partner while sleeping if necessary. This creates a nice multipurpose option at a very low price. There’s no need to suffer through another cold night. The Double Sleeping Bag by Sleepingo allows you to sleep comfortably anywhere, anytime. It doesn’t tear in tight conditions and is convenient to carry. It has a tough, durable outer shell along with a comfortable, silky inner lining made out of a combination of Tetron and cotton. It is waterproof and made out of camping-grade polyester fabric, meaning it will last you a lifetime even in challenging conditions. Because it can be used as two separate sleeping bags, it offers maximum versatility at a shockingly low price. The Sleepingo Double Sleeping Bag is one of the best rated and reviewed of its kind, (see amazon reviews here) offering versatility, portability, and comfort all in one. It is one of the warmest double sleeping bags on the market. 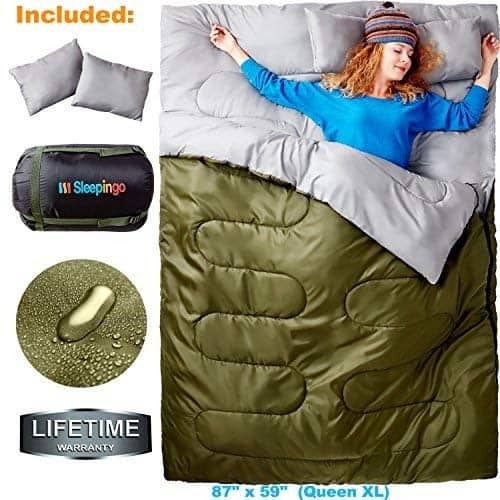 Interestingly, customers’ favorite features of this sleeping bag are the pillows. While most sleeping bag pillows are hard and uncomfortable, these are worthy of mention on their own. If you have ever camped without a pillow, you know how painful and sleepless your nights can be. These pillows are exceptional, offering comfort and durability throughout multiple uses. This sleeping bag, with a 210 thread count that is practically unheard of in a sleeping bag, offers ultimate comfort. According to customer reviews, it is one of the most comfortable sleeping bags you can buy – not just for the money, but compared to all other double sleeping bags. This bag is also easy to pack. It can easily be stuffed into the included carrying case and it weighs less than six pounds, making it one of the lightest double sleeping bags on the market. Whether you’re tall, short, or somewhere in between, this sleeping bag will provide you with unlimited comfort without bogging you down on the hike into the campsite. The Double Sleeping Bag by Sleepingo is the best double sleeping bag for backpackers, coming in at a weight that is lighter than many single sleeping bags when considered individually. It makes summer, fall, and spring camping a lot more enjoyable, offering comfort and resilience to most temperatures and weather conditions. 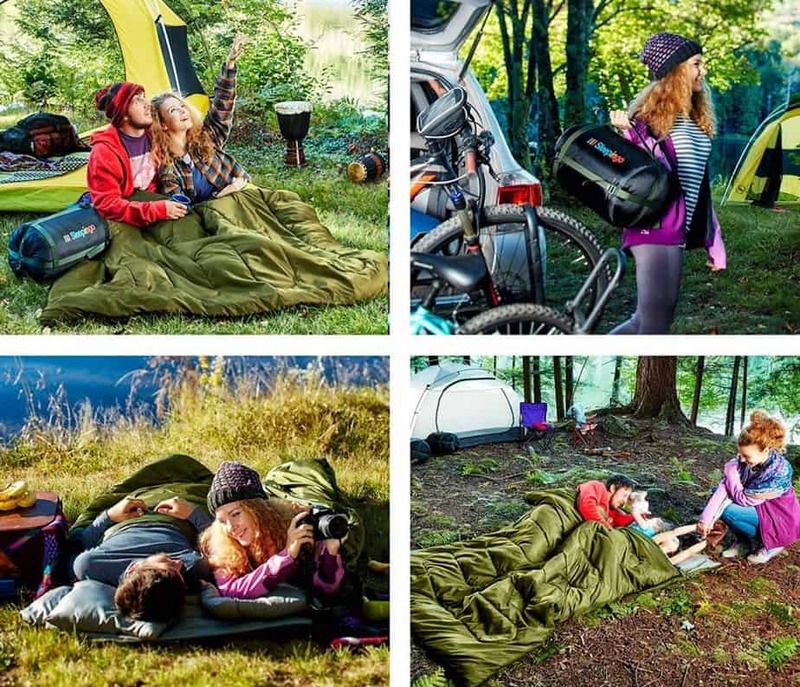 If you want to enjoy the luxuries of modern camping but don’t want to lug a heavy, cumbersome double sleeping bag into the woods, the Double Sleeping Bag by Sleepingo is the right choice for you.